Marisa was born on a sunny day on June 9th, 2008 with no complications and in perfect health. She was the much awaited, desired and beloved little sister of 3 1⁄2 year old Chiara. For all of us, she was the most precious gift. As the last of six grandchildren, she was the little mascot of the family and with her cute face, her magnificent blue eyes and good-natured character, this role suited her perfectly! As her mother, I wanted to be particularly careful to avoid all the “beginner mistakes” I had made with Chiara. Marisa never had a diaper rash, conjunctivitis, ear infection or the like. She was a good eater, a good sleeper and quickly grew up along her 50-percentile growth curve. She was a girl full of life, who loved to play with the ball, to blow kisses to mum and dad, sing songs and clap her hands, stroll around the house in her little car to explore new things every day and make funny faces with her sister. Despite her good health and strength, one day she got a fever. We noticed the weekend of May 9th-10th she was sleepier than usual with two long naps rather than her normal one. On Mother’s Day, Sunday May 10th, she had a slight fever. We kept her inside during the afternoon and, as she started teething in the upper part of her mouth, we gave her one suppository of paracetamol. Never in life would we have thought that this would be our last weekend together. Sunday night she was extremely irritable and almost did not sleep. Monday morning she had a high fever of 103.46 F and was immediately taken to the paediatrician who said she had a viral pharyngitis, which is accompanied by a high fever. She was given suppositories to keep the fever down for two days. Tuesday evening the situation worsened and despite medication she still had high fever. On Wednesday early morning I again called the paediatrician to tell him that Marisa was not doing any better. Marisa started to vomit at about 9:15 am and also started having slight neurological symptoms, with a twitching left lip and eye. We immediately took her to the paediatrician who called the ambulance. At 9:30 am at the paediatrician, she started having more serious convulsions on the left side of her body. The ambulance and doctors gave her an oxygen mask and medication to contain the convulsions. She was brought to the hospital where she woke up from the sedation she had received. Her immediate convulsion had stopped but she stayed paralysed for a couple of hours on the left side of her face. We were told her status seemed recovered by about 12:30 pm. The doctors wrongly decided that she had fully recovered and the atypical convulsion was probably only due to a viral infection and that the only possible viruses with such symptoms were Adenovirus or Coxsackie, which afterwards was proven completely wrong. At 12:00 pm a blood sample was finally taken which showed serious abnormalities, yet the doctors still did not react. In the afternoon, she was somnolent and apathetic and continued to vomit and received an IV solution only at 4:30 pm to re-hydrate. That afternoon and evening her temperature stayed low – too low, less than 96.8 F- and Marisa slept most of the time. Suddenly at midnight her fever increased, very fast until 2 am. She then started to have a second convulsion, which was difficult to contain despite repeated injections. The doctor finally arrived at 5 am and a series of exams were started. The CT scan showed that she had already a serious oedema on the right side of her brain. She was brought by helicopter to the university clinic intensive care unit (CHUV) at 7:30 AM on Thursday where she was operated on to relieve intracranial pressure. She was then put into an artificial coma and hypothermia, however it was too late. Only in the late evening of Thursday night were we informed that she had had bacterial pneumococcal meningitis. On Friday morning the relevant exams showed that her brain was seriously damaged that there were no more signs of life. She died in the late evening of Friday, May 15th. May her soul rest in peace; she will always stay our adorable little daughter. 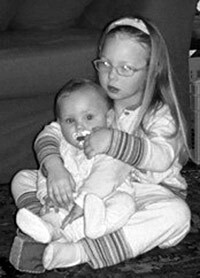 We learned after her death that she had had an invasive pneumococcal serotype 1 infection, not covered by the vaccine Prevnar. The antibiogram of this isolate showed that it would have responded to all common antibiotics – her meningitis was just not diagnosed and treated correctly. How can a child in perfect health and with all the means we have die so brutally and fast from an infection? Why was the infection not diagnosed on Monday or by the latest Wednesday immediately after the first convulsion? Was it really impossible to save her, or are we just missing the right methods and guidelines? We were introduced to R Baby Foundation after seeing their powerful ad. Like the Rabinowitzes, we also learned, tragically, that viral infections can take over babies very quickly and that they show symptoms differently than older children. We know that it is important that doctors receive better training to be able to understand these differences. A fast, and accurate diagnosis can literally be the difference between life and death as it was for our family. Inspired by our need to honor Marisa and help avoid the death of other children, we created the Foundation Marisa Sophie and are working with the team of the paediatric intensive care unit at the Lausanne University Hospital. After reading about R Baby’s work, I reached out to them to let them know about our work in Switzerland and their response has been wonderful with offers of help and mentorship. Together, I know that more babies will have more birthdays.